The New Voice of Downtown Toronto has a new home! A new interactive website for the VA3XPR repeater launched today, allowing users quicker access to information they need. In addition, the page now supports an easy to read schedule for the VA3XPR Global 360 Net, allowing participants to quickly find the events they wish to participate in. “We heard from our users that they wanted easy access to frequently used information.”, said Don Trynor, VA3XPR Repeater Sponsor. “We’re confident that this new website will deliver exactly that and more”. The new VA3XPR website allows users to access a full range of multimedia & interactive information, including a Google Maps-based coverage map, photo album, social media postings, enhanced search capabilities and live RSS feeds. 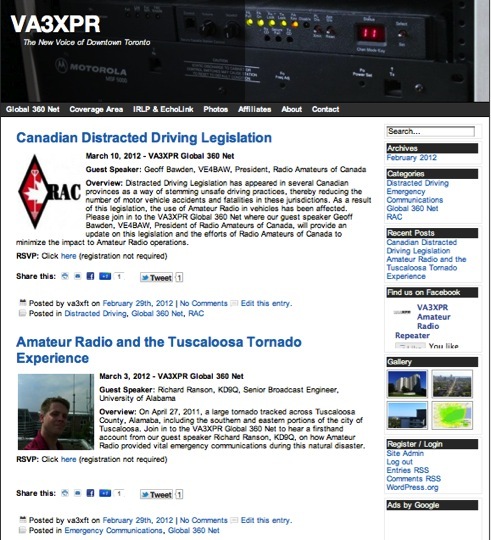 VA3XPR Repeater Website Now Mobile Friendly!